Well I gotta cover ElecTRONica soon, since it will be going away. 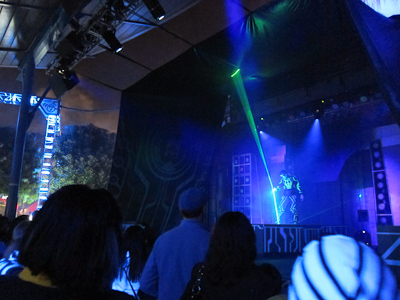 Its replacement is the Mad T Party which quite frankly looks super-awesome. The Mad T Party opens on June 15th, which will pretty much be the most awesome day in history. 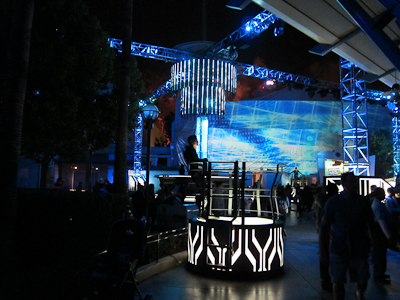 ElecTRONica is a nighttime dance party themed on the movie Tron. It’s in the Hollywood backstage area. Now I should probably say that I didn’t see the movie TRON: Legacy, which was the second Tron movie. This is what happens when you have a little kid. 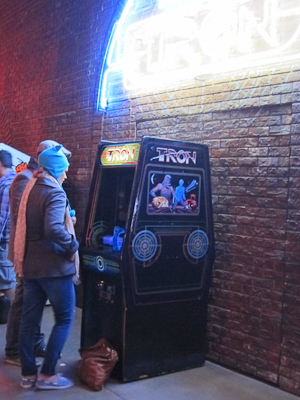 However, I loved the original Tron. I mean, I think I only saw it once in the theater, but I remember it being amazingly awesome, and I’m kind of afraid to see it again, lest it be not as amazingly awesome as I remember. Right outside of Off the Page was this cool disc throwing competition. I wanted to play, but they didn't pick me, sadly. 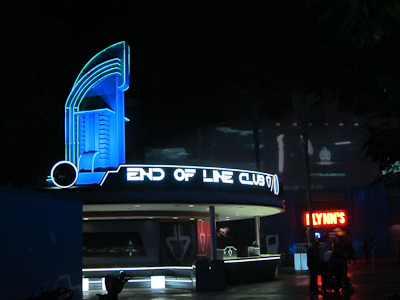 Tron also features into a singular experience I had at Disneyland–the only time I have ever been evacuated from a ride. It was back *mumble* years ago on the Peoplemover. Back then, the Peoplemover went through a tunnel that was the “World of Tron.” It had this super-speed film of the light racers zooming back and forth. The nature of the film was to give the illusion that you yourself were going extremely fast and making these turns and cutting people off and whatever. It was disorienting, but over pretty quickly. Unless you got stuck there. We were there, in the tunnel, movie racing around us, for a LONG time. At first it was like “wow, this is cool!” and then it was “Hmm, I’m feeling a bit motion sick” and then it was “please make it stop.” Looking around, all of us basically had our heads in our laps trying to block out the view. Finally it shut off and a cast member appeared to walk us out. It is a true testament to Disney that in all the times I’ve been there, that’s the only time I’ve ever needed to evacuate. Anyway, ElecTRONica is a dance party. First there’s Laser Guy. It probably doesn’t look very impressive but I can assure you, it’s impressive in person. There’s that beam of light and he moves it around and bends it and stuff. Very cool. 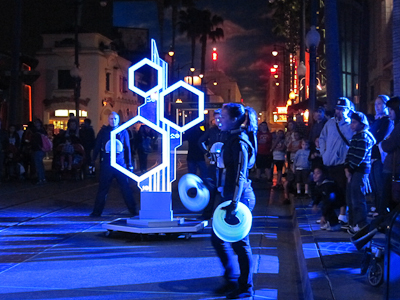 Much of the area is open for dancing, with round platforms and cast members in costume to make sure that nothing gets too out of hand. It was a weeknight, so it wasn’t in the least bit crowded. That helped. There are lots of projections everywhere. Are there churros? I don't know. It was closed. Also incidentally, in the best commercial Disney ever made, where Darth Vader finds Star Tours closed and spends the day riding the attractions, ElecTRONica is the only non-Disneyland Park clip. Heh. 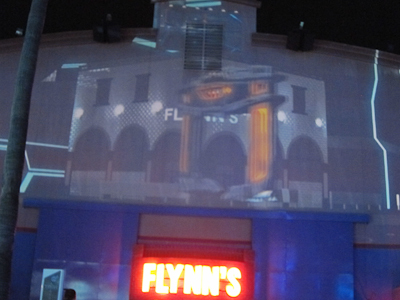 There’s Flynn’s, which is an old school arcade. 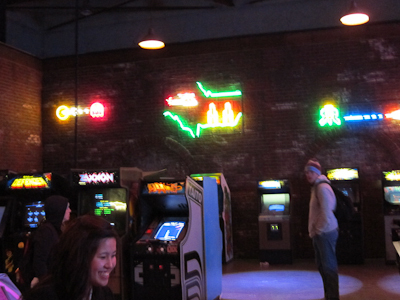 When I was younger, Santa used to fill my stocking with quarters so my brother and I could go to the arcade. Those were the days. ElecTRONica is very cool. I am also looking forward to the Mad T Party, which I suspect will be cool too. Because what isn’t at Disneyland? You must have ride luck, Kharma, something. In 2005, my last visit before getting an AP this year, I was evacuated from the Pooh ride. This year we have been evacuated from BTMR, Snow White, and Monster’s Inc. During our last trip I thought I was going to be evacuated from Space Mountain. The train was stopped on the first lift hill (another annoying to the senses place). After about 5 minutes CMs evacuated a man and his 3 children. They believed he had stood up. He was 6′ 5″, and says he did not stand up. Anyway, once he was gone the rockets were sent on and we got to finish the ride. I agree on the ride karma thing… years ago we were evacuated from matterhorn. We had to walk down part of the outside of the mountain. It was kind of neat! Last year, we were stuck on small world about 20 feet from the exit for about 20 mins. It was HOT, really hot and our boat was right next to the walkway. We finally just got out and walked off. The CM’s weren’t that happy but I couldn’t sweat any longer. That same day, pooh broke down on us but, luckily, we had just gotten on the car and we were able to get out immediately. I know I’ve been on other rides that have broken down but I can’t recall exactly. 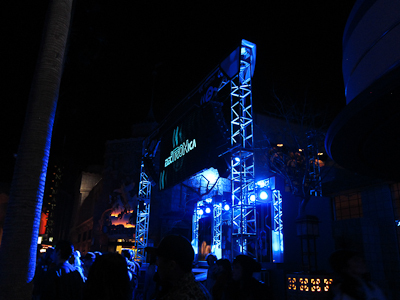 I’ll have to check out electronica before it leaves… do you know when that’s supposed to be? what’s this mad t party thing that’s in the works?